Well, here we are in 2012. I wonder what the year will bring. You can make all the plans you want, but sometimes things don't go the way you expect. We are making plans, but there is nothing written in stone...yet. We have pretty much decided not to take Sherman to Panama this year, although we may still go into Guatemala and Belize with him. Or we may park Sherman and fly out of the country for a short time if we can find a cheap airfare deal. All of this will happen after our daughter leaves in mid February. We probably won't even make the decision until then. We're also considering summer plans. We were looking at a four month house sitting opportunity near Vienna, Austria. But again, we're not willing to commit to something like that until March or April, so odds are good something else will come up. We don't really care where, although a two to four month house sitting stint in Europe or the U.K. would be our preference. We're also considering driving our little car all the way from Canada to Chile and Argentina, and using couchsurfing and hostels for accommodation as well as bringing our tent. So, who knows what adventures the year will bring. We had a great pot luck dinner last night with all the campers. There were 22 people, and there was lots of delicious food. Everybody at Hacienda Contreras enjoying New Years pot luck buffet. We sat around and talked for a few hours and then we went back to Sherman and watched a movie. Co-incidentally, the movie ended right at midnight and we heard some fireworks going off in the town at the same time. So here we are in 2012! Grandson Cameron welcoming in the new year! Happy New Year to you both!..sounds like you have some interesting plans in the works for 2012! !..we will be sure to be along for the 'ride'!!! Lots of choices in the New Year, can't wait to follow along and see what transpires! Wow, we really are kindred spirts. We fly off to Belize in a couple of days and will spend the next two months backpacking through Guatemala and Honduras. We should be back in Belize sometime late February. If you find yourself in the vicinity, maybe I could buy you guys a Belikin. Great idea's for the upcoming months, no matter where you are we will be right with you following along, Cameron looks so cute as a New Years Baby.Hope you have a great year. Be safe out there. Sam & Donna. Love the picture of Cameron and Happy New Year to you both. Love that picture of your grandson. Happy New Year to you and may all your adventures be happy ones. Now those are some interesting prospects! Sounds like a wonderful New Years Eve and a great way to windup the year. The beauty of your lifestyle is that you are pretty well free to go wherever you want with minimal planning our fuss. Happy New Year! You have a lot of great options. This morning I have been thinking about where I want to go this year, also. Sounds like there are some fun choices in that list. Happy new year! Happy New Year to you both. Nice to see such a delightful New Year's Eve and to hear about all your adventurous plans for the coming year. wow! Love reading your blog, and though I don't comment often, I am usually following right along. Happy New year to you happy travellers. Enjoy the next year and above all, have fun! Happy New Year! House sitting outside Vienna? That sounds interesting. I didn't realise there was that much of that sort of thing in these parts, but then again I'm sort of out of that particular loop. We'll all be "staying tuned", so to speak. Happy new year to you! Looking forward to reading about your adventures! That is one of the most precious pictures I have ever seen. He is a doll! You two have to be the most adventurous couple we know. I don't care where you go...just take me along with your blog! Looking forward to following along with you as you enjoy a wonderful 2012. Thanks so much for sharing. Cameron looks a real cutie. Hope 2012 is kind to you and you continue to enjoy your travels. From reading your post, It sounds like I have a lot to look forward to when reading your posts. 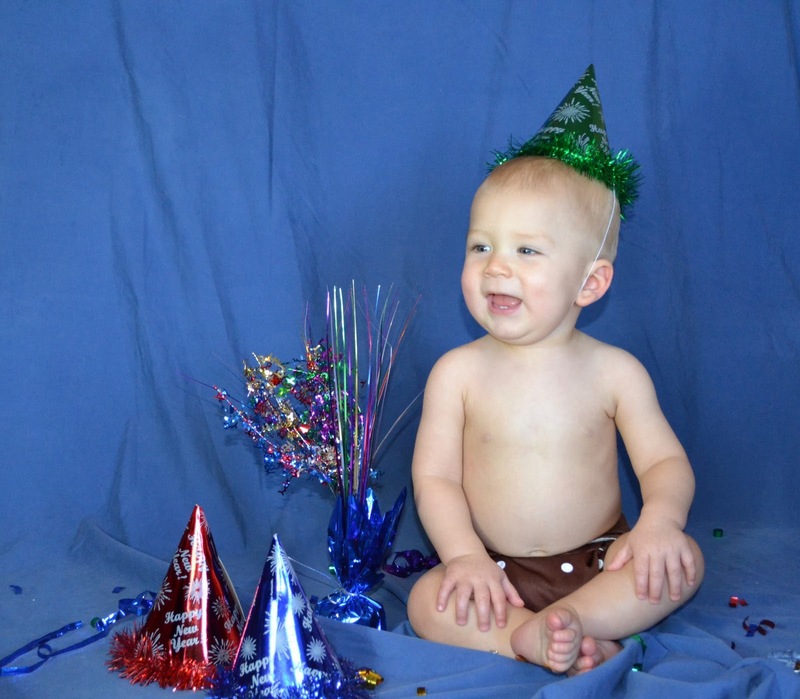 Cameron is an adorable Happy New Year Baby. That Picture needs to be entered in to some sort of baby picture contest. He would be the winner for sure!!!! !